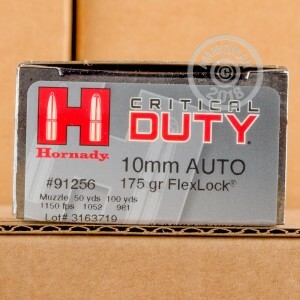 Hornady Critical Duty ammo is designed to deliver strong terminal performance against an assailant even through vehicle glass, sheet metal, and other barriers. Used properly with special care to manage over-penetration risk, it is one of the most effective defensive loads on the market! 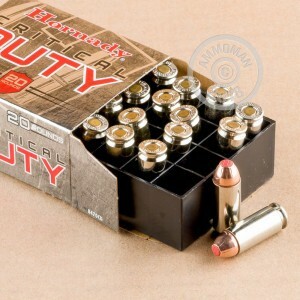 Each cartridge in this box fires a 175 grain Flexlock hollow point bullet at a muzzle velocity of 1,160 feet per second. Flexlock bullets are polymer-tipped, a feature that helps prevent clogging of the expansion cavity and helps the petals move outward upon contact with the target. This ammunition is loaded in the USA and uses non-corrosive Boxer primers and nickel-plated brass cases. 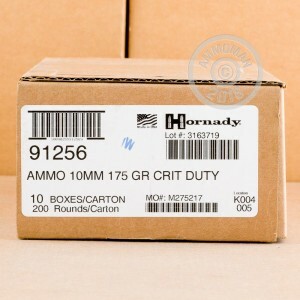 Each box contains 20 rounds.